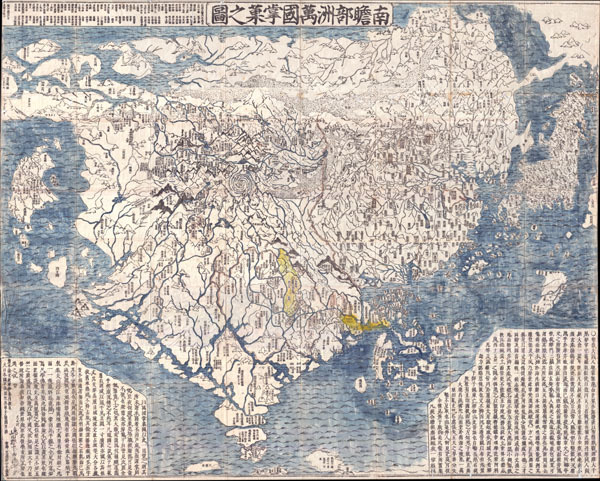 First Japanese Printed Map to show European geographical information with Buddhist world-view. A seminal map. This is the first Japanese printed map to depict the world, including Europe and America, from a Buddhist cosmographical perspective. Printed by woodblock in 1710 (Hoei 7), this map was composed by the Buddhist monk Rokashi Hotan. Inspired by the 1653 publication of Si-yu-ki, a pilgrimage narrative of the Chinese monk Hsuang-Tsang's (602-604) travels to India in search of sacred Sanskrit writings, Rokashi Hotan's map attempts to update Buddhist mythological cartography, as exemplified in the 1634 manuscript map Gotenjikuzu (Map of the Five Regions of India), to correspond with the Si-yu-ki, as well as with contemporary and ancient religious texts, Chinese annals, travel narratives, and even some European maps. Rokashi Hotan lists these texts, 102 in all, at the top of the map. The consequent product of Rokashi Hotan's work is this magnificent amalgam of disparate ideas and traditions. In essence this is a traditional Buddhist world view in the Gotenjikuzu mold centered on the world spanning continent of Jambu-Dvipa. At its center is Lake Anavatapta, a whirlpool-like quadruple helix lake believed to be the center of the universe. This lake, which is commonly associated with Lake Manasarovar in northern India, is believed in Buddhist mythology to be the legendary site where Queen Maya conceived the Buddha. From the quadrouple beast headed helix (heads of a horse, a lion, an elephant, and an ox) of Manasarovar or Lake Anavatapta radiate the four sacred rivers of the region: the Indus, the Ganges, the Bramaputra, and the Sutlej. South of Jambu-Dvipa, India is recognizable for in its peninsular form. Japan itself appears as a series of Islands in the upper right and, like India, is one of the few recognizable elements - at least from a cartographic perspective. China and Korea appear to the west of Japan and are vaguely identifiable geographically, which itself represents a significant advancement over the Gotenjikuzu map. Southeast Asia also makes one of its first appearances in a Japanese Buddhist map as an island cluster to the east of India. Of special note is Rokashi Hotan's mapping of the Americas. Prior to this map America had rarely if ever been depicted on Japanese maps, so Rokashi Hotan turned to the Chinese map Daimin Kyuhen Zu (Map of China under the Ming Dynasty and its surrounding Countries), from which he copied both the small island-like form of South America (just south of Japan), and the curious land bridge (the Aelutian Islands?) connecting Asia to what the Japanese historians Nobuo Muroga and Kazutaka Unno conclude 'must undoubtedly be a reflection of North America' (page 63). Whether this represents ancient knowledge from early Chinese navigations in this region, for which there is some literary if not historical evidence, or merely a printing error, we can only speculate. Rokashi Hotan's map became the model on which all future Japanese Buddhist world maps were drawn well into the 19th century. The confused cosmological view upon which his map is based, referencing at once religious, secular, and non-Buddhist teachings, matched the growing religio-secular conflict that would emerge in Japan during the coming centuries. Ultimately this is one of the most important, beautiful, and influential printed maps ever to emerge in Japan. Two identical versions of this woodblock map appeared in 1710. The more common was published by Chobei Nagata of Kyoto. A less common example was published by the bookseller Bundaiken Uhei and corresponds to this example. Bundaiken Uhei's mark and name appear in the lower left quadrant. In most examples coloration varies. A strong crisp image suggests that this is one of the first examples that Bundaiken Uhei printed, as wooden plates tend to wear quickly and many other examples show signs that the woodblock was more heavily worn. A must for any serious collection of Japanese cartography. Zuda Rokashi Hotan (1654-1728) was a prominent Buddhist scholar-priest active in Japan during the late 17th and early 19th centuries. Zuda Rokashi, or Hotan his religious name, is the founder of Kyoto's Kegonji Temple. Rokashi Hotan is best known in cartographic circles for his composition of the important Buddhist world map, Nansunbushu Bankoku Shoka no Zu (Outline Map of All Countries of the Universe). This map, which attempted to reconcile traditional Buddhist cosmography with modern scientific cartography and European cartographic innovations is one of the most important maps ever printed in Japan. Its composition and wide popularity influence Japanese Buddhist cartography well into the 19th century. Bundaiken Uhei (fl. 1680 - 1720) was Japanese bookseller and publisher active in Kyoto during the early part of the 18th century. His is best known for his publication of Rokashi Hotan's important Buddhist world map, Nansunbushu Bankoku Shoka no Zu (Outline Map of All Countries of the Universe). This map, which attempted to reconcile traditional Buddhist cosmography with modern scientific cartography and European cartographic innovations is one of the most important maps ever printed in Japan. Its composition and wide popularity influence Japanese Buddhist cartography well into the 19th century. Very good. Minor unobtrusive wormholing. Else very clean. Cortazzi, H., Isles of Gold: Antique Maps of Japan, p.38 and plate 48. Unno, K., Cartography in Japan, pp. 346-477. Yamashita Kzaumasa, Japanese Maps of the Edo Period, p.33. Nobuo Muroga, Kazutaka Unno, 'The Buddhist World Map in Japan and Its Contact with European Maps', Imago Mundi, Vol. 16 (1962), pp. 49-69. Ramming, M., 'The Evolution of Cartography in Japan', Imago Mundi, Vol. 2 (1937), pp. 17-21. National Library of Australia, MAP RM 3882. University of British Columbia, G3201.S2 1710 H6, G3201.S2 1710 H6a. Christie's, Natural History, Plate Books and Cartography, June 7, 2006, sale 7225, lot 94. Bean, G. H., A List of Japanese Maps of the Tokugawa Era, Jenkintown 1951, 1710.1 . Ramming, M., 'Remarks on the Reproduced Japanese Maps', Imago Mundi, Vol. 10 (1953), p. 128. Harley, J.B. and Woodward, D., The History of Cartography, vol. 2, p. 427-429, fig. 11.59. Rumsey 5763.001.